Kate Middleton showed up to the England v Wales rugby match on Saturday, September 26, with Prince William and Prince Harry wearing flower-printed pants (Kate wore the flower pants, not Harry). Such whimsy from someone so un-whimsical. Then yesterday, new pap photos of Prince George and Princess Charlotte showed up in an Australian tabloid. What should we start with? Let’s start with George and Charlotte because what is there really to talk about with a rugby match other than clothes and funny faces? George and Charlotte were photographed outside Kensington Palace with Nanny Maria watching a royal helicopter land on the grounds (the helicopter was carrying Princess Anne). The article accompanying the photos does not say when they were taken, but they are clearly fairly recent. Do you guys want a George throwback pic? Sure you do. Charlotte looks so much like George, right? On to Kate and those flower pants. As I mentioned, Harry, William, and Kate attended the England v Wales rugby match on Saturday at Twickenham Stadium. Harry is Honorary President of England 2015 and Vice-Patron of the Rugby Football Union (since 2010) while William is Vice Royal Patron of the Welsh Rugby Union (since 2007). So Harry wore white as he cheered England, and William wore red as he cheered Wales. Kate wore black, mostly, but wore a red scarf and cheered Wales. Wales beat England 28 to 25, so William and Kate were thrilled while Harry looked a bit miffed. Kate wore the “Floral Print Trousers” ($39.90) from Zara. 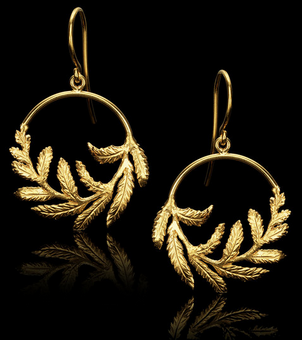 Kate brought out a new pair of Catherine Zoraida earrings, the “Fern Hoop Earrings” in gold (£150.00). Kate also wore what looks like a fur trimmed black blazer, a black shirt underneath, and a red scarf that probably the one she wore during the Canada tour in 2011 and to Christmas in 2012. She carried a black clutch. As I said up top, such whimsy from someone so un-whimsical. Kate hardly ever wears pants to begin with and then she busts out flower pants. So odd. But I like the Catherine Zoraida earrings. I love Kate’s other pair of Catherine Zoraida earrings, too (the Double Leaf earrings she debuted in 2012 and wore to Uluru and Christmas in 2014). Here are some more photos from the match including William side-hugging Kate, and some funny faces. Here’s some Prince Harry and his Ginger Beard. Also, Harry’s faces in some of these photos are great. Harry wasn’t too thrilled that England lost. OK, so first, the children. Rather cute and I love it that Maria takes them to see the helicopters come and go. Nice too that they then get to see relatives who aren’t Middletons. Is Charlotte teething? She seemed to be sucking on her hand, or thumb. I’m not quite sure about George’s children of the corn hair colour, but oh well. Sorry, I think those pants are fugly, we dont really do that fashion here, well maybe at the beach or in bed but not to a game. Kate’s face pulling is weird and I’ve never seen anyone throw their hands in the air like that while hanging on to their thumbs. Just weird. George can’t help his hair color. I don’t like the pants either. I love polka dots so I was willing to give her the benefit of the doubt when I thought they were polka dotted pants, but I don’t like the flowers. The print is so tiny and busy and I really don’t like them. I meant to say something about George’s hairdo, not the colour. It must be fun trying to slick it down in a side part every morning, I bet he is always moving fast so Maria would be chasing him with a brush to get the job done. I think the photo of Maria, George and Charlotte is so cute and shows a great dynamic between Maria and the kids. I get kind of bored with the way they style his hair – slicking it down with a side part. They should just let it be natural. When left natural, it seems to be a bit curly. I had pants like them in the eighties when I was twelve. They don’t need to make a comeback. Agree – and not by a royal in public representing HM. She is tagging along with sister at past Tennis Royal box (‘common’ indoor homewear). Note how sincere and happy lazy Donothings are at sporting events (celeb red carpet), compared to attending duties with charities, visits under an hour to give back to the people. They both had no problem leaving the children for hours, to attend prime seat games. The children with loving, hardworking Nanny Maria, hopefully will learn from her work ethics (caring for both). I loathe the way these (three stooges) ham for the press (yes even you Harry). Their stupid fake team rivalry. Oohhh Harry is so mad about will and Kate singing the Welsh anthem…. You three aren’t the least bit funny…cheesy and a little lame maybe…and yes Kate is rooting for the same team a William, surprise everyone! This photo call reads like a bad sitcom…shall we call it “Ginger and Two Twats”. Sounds like a sitcom for 2am when everyone could care less whats on television….Bleh. Kate, your face is starting to remind me of Skeletor! Have a hotdog and a beer! PS why is Kate wearing my pajama bottoms! I was wondering where they went. In Harry’s defense, I doubt he was mad that W&K sang the Welsh anthem. That was something the press made up giving the funny photo of him looking at William. I’ll give her credit for wearing trousers but why did she have to pick a printed pair!? It looks like she is wearing pyjamas. Not a fan of the earrings either. She looks like she belongs in Nashville with her new hair style and big teeth. I think Kate has got new (BIGGER) teeth. Am I wrong? First thing I noticed were how weird her teeth looked – I don’t know anyone with teeth that reflect – definitely big false teeth. I’m not sure how the veneers actually work, but why would they make this go round larger than the last? Did she really approve of that? I think they were recently whitened. I’ve seen this on other celebrities before, unnaturally white teeth make them much more noticeable. Veneers cannot be whitened or stained but they can totally be revised. They do look bigger and more “horse” like. Not sure just yet but she did something to her teeth and face. Have you ever googled her and just looked at her goole images? This woman has an ever changing face and it ain’t makeup techniques. I can understand doing botox but this is something else and I can’t put my finger on it. Almost reminds me of what Britney Spears did to her eyes, like a eyelid lift possibly. She looks incredibly different than she did in 2012- 2013. I thought she had changed her teeth when we saw her in the houndstooth dress. It finally dawned on me that her wonky bottom tooth has been aligned with the rest of her bottom teeth. It was really wonky, so I understand why she would want to fix it! Yes! That tooth bothered me. If you are going to pay for new choopers, they all need to be straight. I feel like I can talk. I literally had buck teeth. I’m talking Laura Ingalls (a la Melissa Gilbert) buck teeth. And I had crowding and a snaggle. I wore braces for 4 years with headgear. While in high school. I’m really funny about that. Good catch Lizzie! I had not noticed that, but I just want back and looked. Sure enough, her bottom teeth are fixed. I don’t mind her fixing her teeth, but I didn’t realize that’s what maternity leave was for. I wonder what else she had fixed???? I wonder though, it takes more than a few months to straighten teeth. They look shaved down now as well since they are the same level across. Why did she wait this long though to fix them since she has been in the public eye for so long? I still think she has veneers on the upper teeth. She got the bottom teeth fixed a while ago. The really visible extra large chompers are what’s so disturbing. Harry is fantastic and so handsome! I just love him and his faces and looks really are the best! It’s great to see the kids and both are getting so big. I hope Will and Kate don’t complain about the pictures. I know we aren’t seeing all the pics but with the noise of a helicopter no one probably realized the photographer was snapping shots. The family are public figures and either they should release more shots or photographers will find a way to get them. The constant cries about their privacy and “normal life” have gotten very old. Just consider the elements of this private family snap: children with their nanny, on their palace grounds, watching their great aunt return in the family helicopter. It’s not what most of us would consider normal. I love Kate’s new earrings but the pants, um….no! You make a good point – “Stop photographing my children and our help while they watch helicopters land and take off at our palace!” really is not going to go over like he thinks it will. Yes, the poor put-upon act in the midst of all this luxury and privilege isn’t cutting it. Apparently, she is copying Diana again with the pants. I said, that any girl would look like kate, who was an dippy looking baby. C looks like uncle gary. I find it funny and a little ironic. All of the people who, wanted a baby girl/english rose 2.0. They got another mini middleton. The Diana comparison was my first thought. Kate tries something “daring” and “different” and gets the press to say how she’s fashion savvy like Diana. Except the pants are hideous. Haha. Also yes Charlotte I think will be a lighter haired Kate. The pants are very eighties. Maybe that is where the Diana reference comes in. True or not. They don’t need to make a comeback. They were ugly in the eighties and the look hasn’t improved with time. What is dippy and how does a baby look dippy? I am not a of fan facial, but his beard is looking really good this time around. Maybe because he had it trimmed? Anything is better than the yuk-inducing and tiresome skinny jeans with the wedges of doom. I can live with these pants but I must say that her fashion choices are seriously deteriorating. This woman is in serious need of a stylist. Wish there was a better picture of Charlotte from the front. Prince George looks like Kate/her father clone. compared to the awful jeggings/jeans and stripe top…. I’m not a fan of the cut of the trousers but I’m generally pleased to not see her in a dress. Clearly Kate got the memo that it’s a sporting event and there’s no need for a dress/dress-coat combo like she’s worn previously. That’s one thing I’m pleased about with Kate’s recent appearances, she seems to be dressing appropriately for the occasion. Like wearing a knee length dress to the prison, maybe a bit high priced but still “work” attire. As for the pap pictures I don’t really see what W&K can do. If they complain in Australia the Australian media WILL lash back. There’s not much they can do to remove the incentives for these types of magazines to pay for pap pics except maybe releasing a picture of their own once in a while. Rather than keeping the kids locked away so much that the prices the mags will pay for pap photos goes up. Not sure if you saw it either KMR but an Aussie mag did a pretty rough article recently about how CP Mary was considered the most fashionable royal lady in the world (Maxima 2nd) in a recent poll and Kate came 3rd. They mentioned how Kate’s style was dull and like an old lady, and that she couldn’t master dressing for her age. They were obviously boasting about how the Aussie Mary is super fashionable but it was nice to read a story that wasn’t Kate worship. I can’t remember if someone linked to it or not previously. But the Daily Mail had a fairly lengthy article about CP Mary and her work. They were basically saying this is what a princess who works looks like and they called Kate invisible and lazy as well. I agree with what you said that it’s nice to read an article that isn’t Kate worship. Thank you for this article. I will see if I can find a link to the Australian one. This isn’t the article I was referring to but it is similar. Also a Mary and Fred movie is being made yay!! Thanks for the article link as well! I admit I don’t follow CP Mary too much. But she definitely looks put together. I’m sure she has a stylist, and it shows. Hopefully the Fred and Mary movie is better than the Will and Kate movie. That one was over the top and very, very cheesy. Thanks for the link bookworm. Mary shows how it is done and Kate hardly does anything compared to her. I just think Mary comes across far more genuine than Kate. Just shows what Kate could do if she actually put some effort in. I love the little digs they took at Kate. Mary has a natural warmth to her. I think you either have it or you don’t. Unfortunately, Doolittle does not. I loved this article. Howver, they named Princess Beatrix as her daughter. Umm, that’s her MIL. I dont even how kate came third in that fashion list, seriously, leitizia, charlene, mathildre are all better dressers than kate, her dresses are not impressing at all and all those coats she wears in different colours, her body is soo frail, shes mostly in coats!!! We could just about include CP Mary as a welcome professional ‘English Rose’/Australian – hardworking Royal – her parents are (no offence). Her/CP Fred formal portrait is lovely! Charlotte looks like a cutie, very huggable. I don’t care for the pants, but just really, don’t care. Kate makes everything look uninteresting. For the parents of a toddler and an infant, they look well rested. Does William actually work anymore? Will this be counted in the court circular? Harry seems brimming with life when compared to the Givenaughts (who can’t give up their obsession with the cameras). I would love to be a fly on the wall at Will’s workplace. When he tells his coworkers/boss that he can’t work full time because he has royal duties to do, and everyone can see through the press that royal duties = attending a rugby game. Spot on, both well rested (super Nanny Maria on mummy duty). George is too grumpy looking for a toddler (lack the innocent pleasure of a child). Let’s hope more time away from carol and with Maria and Charlotte will change that. On the pictures of the kids…I love to see them. Sorry William but people are interested. I am curious about George’s hair color. He must’ve spent a considerable amount of time playing outdoors and the sun naturally highlighted his hair. If you look at a baby picture of Kate, she’s sucking on her fist in it as well. As for the rugby match, I’m glad she took our advice and didn’t turn up in a dress and heels again (although I don’t know what shoes she had on) and I’m doubly glad they weren’t the dreaded jeggings. I do think she looked kind of, well, medicated. Maybe it was a combination of being at a sporting event with her husband and Harry, but the looks she had. I’ll leave it at that. But I would like to say I wish they’d do something with her hair that doesn’t highlight the fall/wiglet she’s been proudly tossing back and forth lately. As for Harry, he’s just gorgeous. It’s like the more William morphs into Mr. Burns, the better looking Harry gets. My only peeve with Harry right now is the smoking. Probably never stopped, but seeing it in the recent photos just irks me. Personally I can’t stand being around cigarette smoke and considering his great aunt and great grandfather had illnesses that were smoking related, you’d think he’d be a bit wiser. Bahahaha, “William morphs into Mr Burns” hahaha!! I totally see the resemblance. Wait. He smokes? I may need to rethink it. My dad died of lung cancer and he went through torture. Yes, I’m sure Harry would stop smoking if he knew why you didn’t like it, Rhiannon. Harry is stealing William’s soul and by doing so Harry gets hotter and William gets rougher. I hate the smoking, too. It’s just gross to me. It stinks, for one, and it’s just dirty with the ashes and the butts. Oh, Patricia, I so agree with you as ato how Kate looked in that solo photo. Her eyes did look strange and it does seem as if she is on something. I hated the pants, too. And, found it interesting that William sat between Harry and Kate. The photo of William with his arm around Kate? I actually was touched by that. And, the babies? Adorable! Nanny Maria is a gem. Holding little Charlotte, but also taking little George’s hand. So kind and dear. Yah Tanya, it seems like every time she is photographed lately she looks medicated. She’s got the crazy eyes. It wouldn’t surprise me if she was on something when she bought those pants like you said!! At least we didn’t get to see the jeggings again? 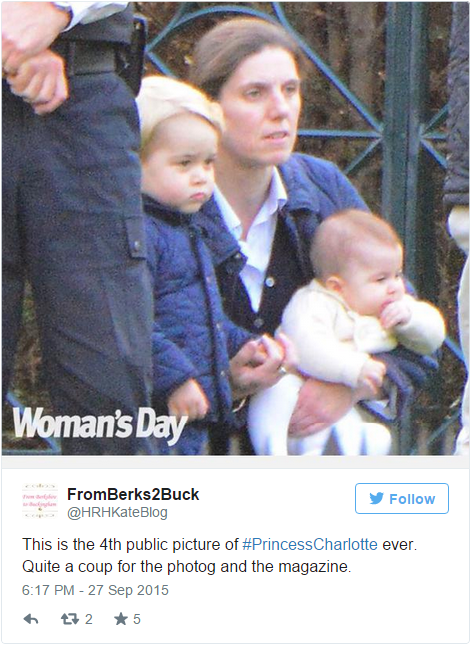 Awww, George and Charlotte are little cuties!!! And those cheeks my goodness, too adorable! As I recall W&K didn’t immediately complain when the photos of Carole and George came out or when the ones of Kate & George at the park came out. I think they will hold their complaints in reserve to use at a later date. As has been pointed out, the photos were taken from public path and printed in a foreign paper so there isn’t much they can say about now, but I’m sure they will use it in the future. On to the Pants! I didn’t think they were all that bad. Certainly not my style but much, much better than the usual skinny jeans and stripped shirt. It seems to me that since the birth of George, Kate has really struggled fashion wise. Like she can’t decide if she’s a yummy mummy or a dowdy matron or a bit of both. I realize though that for the first couple of years after the wedding all that she wore was new and exciting to the public but now it’s kind of been there, seen that type of boring. I think some great skirts and blouses a la Queen Leti would work well for Kate. And of course correcting her posture would work wonders, I swear this woman has the worst posture I’ve ever seen in someone her age. I am really getting the feeling that someone on Kate’s team is reading the critical comments and is trying to find out if she changes things up will that stop the criticism or maybe bring back some of the good feelings people had about the couple. How is the puppy, Lauri? Wishing you the best with your new little one! Thank you so much for asking Mary Elizabeth! She is doing pretty good, definitely has her devil-dog moments but for having a rough start she’s doing great. Oh, have fun with the little one. Puppies, kittens and babies make the world a better place. All babies. Even my now three year old toddler, who has suddenly decided the terrible twos were terrific for her! Ouch! I remember those terrible twos and terrifying threes. Hang in there it does get better and you are so right even terrible toddlers make the world a better place! Also want to wish you much love and happiness with your new pup. But, so full of goodness and joy. Thanks for the nice wishes Jenny! She is my second full time job! Good luck with the Puppy Lauri C, they are adorable. Mary Elizabeth I hear you, I have a three ( turning four next month) little girl and she is a feisty little thing! Dear KMR, I am really not trying to hijack this great post but I really just wanted to share these photos with Rhiannon 🙂 Please forgive me! Rhiannon? Rhiannon? Are you ok? Take some deep breaths! Thank you, Lauri for this link. He is absolutely to die for! Oh, Harry, the world is your oyster. Now, pick your pearl. We need a young, handsome groom to swoon over. Marry soon! I think that we need to send a search party out for Rhiannon. She is MIA. Probably cured up somewhere with a laptop looking at the pics of Harry and rocking back and forth saying, “Precious, my precious”. You called it. I’ve seen so much Harry coverage that I’m overwhelmed with his hotness. I literally gasped on a conference call when I saw the pictures. He’s the total package. I’m getting ready for you Harry. Oh my gosh! Harry with beard in uniform! OMG! Thanks for the link Lauri! Harry is getting better with age. I’m so glad that he still has the beard. Not a fan of the pants, but they are better than the skin tight jeggings and wedges of doom! LOL. Kate’s facial expressions at sporting events are just way too over-the-top. That’s all I’ve got. I honestly can’t find a reason a regular person would make the expression Kate is making in the picture where she’s sucking on her fingers. Like seriously what the?? I think she has her fingers in front of her mouth, not in it. I took the expression as more of a teasing look at Harry watching his team lose. Maybe, and yes i know their not in her mouth but I couldn’t accurately describe what she was doing. It looks so strange. The Harry teasing seems plausible though, haha. I don’t think she’s sucking on her fingers. She’s just pressing her fingers to her lips. And I think she’s just reacting to either the game, or Harry’s outburst. There was a screen to their right. I watched the game and it’s clear during the National anthems when she saw they were on the screen she got happy, like her contained childish giggles happy, and you see the smile come on whilst singing. Both times, the English and Welsh Anthems, so I think perhaps she was checking if she’s on screens. She’s quite aware/focused on whether she’s on screens or not. Opening night you also see her checking the screens during Harry’s speech if the shot was still on her and William or back on Harry. She definitely acts up in front of the camera at times and doesn’t seem to mind the attention. Pre-match drink or 3? Settle her nerves? Was she nervous about all the crowds? Or something…she looks srange since her first apparence in that car in scotland! Ohhh, I don’t like those pants. And, Kate doesn’t look happy — despite those exaggerated grins and open-eyed stares. Sad, that the William and Harry relationship has been altered by Kate’s addition to the family. I thought it was interesting, as well, that William sat between Harry and Catherine. Harry is the star of the family right now. Hands down. What a gorgeous and caring guy. The link to the article where he spoke to the military students? Omg! Someone help Rhiannon off of the floor. Baby Charlotte and her big brother, George, are so cute. Nice to see them. People really do care about them and wish them well. I don’t know how much more I can take, lol. I just want to snuggle with him. He can tell me stories of his time in Lesotho with his dreamy voice. I’ve got too much time on my hands. When is the dinner for the Chinese head of state? I’m eager to see what Kate wears and which tiara will top off her new do. Chances are she isn’t going to attend and neither is Will. II thought they would be there. I probably will get skewered but I do not think George is cute. Poor kid never cracks a smile and having that downturned Windsor mouth (which he cannot help) does not help. No slam, LJA, just a difference of opinion. I think George is darling. He’s like a little old man at times. Then, bam, he’s a toddler once more. He does smile! There are many pix of him doing so. I’m waiting for both kids to lose the ‘generous’ layers of baby fat around their faces before I start really looking at their appearance. It’s hard to see what their features will look like when at the moment they’re all cheeks and eyes. I’m not calling them fat of course their babies, and it’s normal for babies to be chubby but with these two it really obscures their features. Apologies to those who will be offended, but I find both kids to be very plain. PGtips is redeemed by his strong personality. He is very expressive and in videos already asserts himself. Even when he was a wee baby, at birth, at christening. It makes me laugh and wish I were babysitting him because he would be very entertaining and full of beans. Charlotte looks very docile, but we haven’t seen her in video properly so her personality is still a mystery. Whilst she has unfortunate parents, North West was a very beautiful baby. Whatever her personality turned out to be, and including the layers of baby fat, cheeks, eyes etc she was asthetically a very beautiful baby. Suri Cruise was also a very beautiful baby. yep, i too find george looks soo overated like her mother, they are wealthy and have a title, if that is stripped from them no one would like at this family twice walking down the road, all plain!! I didn’t think North West was all the cute as a baby. But I agree with you that Suri Cruise was a very pretty baby. No apologies necessary, to each their own. Agree 100%. Some other websites report his hair is being bleached. Oh Prpa, I really hope that it isn’t true and if it is then Wills and Waity need to be shot. I don’t see why they would bleach his hair. I have a feeling he just has very blond hair. Some children do. My husband at that age had super blond hair that people thought it was bleached. In fact he still has a really blond section in his hair today that people have asked if he dyes it. But it is just natural. I have a feeling George is the same way. I had hair to blonde it looked white. My hair darkened to a darker blonde when I went through puberty. When my son was 2 his hair turned almost bleach white blonde and people asked what happened to his hair. We did nothing to it hair color change is fairly common and sometimes can be drastic. Our granddaughter was born with jet back hair with red tips, and now she is a beautiful little blonde. Oh, that is just beyond ridiculous and contemptible to think that. Eh, to each their own. I’ve seen loads of kids that people fawned over that I didn’t think were cute at all. Chelsea Clinton released a photo of her Charlotte on the little girl’s first birthday, which was Saturday. Mom is holding the little one on her lap and the two are really “into” a story book. You can’t see the little one’s face, but the photo is sweet. Just looking at her chubby little arms, made my heart melt. Wish one had a better look at the babe’s face, though. Maybe Jenny’s point was that Chelsea Clinton is a public figure who understands public interest in her child. She released a photo that speaks to that public desire without really invading her child’s privacy. Diana was said to admire the way JFK Jr. was dealing with his accidental fame. Chelsea is another example of a politician’s child who became a public figure by accident (and no fault of her own) and has to figure out how to deal with it. Thanks My2Pence, that is what I meant. Sorry, Overit, but I should have been clearer. The photo is odd because, Chelsea — is face down in the photo. Like, what? Not only is the baby’s face not too visible, but Mom’s is not! Weird. I guess I don’t see Chelsea as a ‘public figure’, at least not because she’s so awesome and special. She has chosen to be in the papers, other kids of famous or infamous parents simply get on with their lives. I, personally, have zero interest in her or her child. Late to the party but this girl has done things that cause me to resent her being given gushing press. Weird eyes and strange facial expressions. Is she on medication? And I don’t like those busy pants. Kate needs to get a new stylist or figure out how to dress better. She has unlimited clothing funds and access to great designers. Surely she can do better. I miss Diana’s stylish dressing and impeccable style. Every so often those pants become the rage. I always think they make their wearers appear bottom heavy. They certainly attract focus to the lower part of the body. In that solo picture am I the only one who thinks her hair is looking greasy? I know it’s ‘shiny’ on a ‘royal, greasy on a less being’ but it just looks greasy to me. I think Kate definitely got her hair color redone, and it looks way better. I also don’t mind the chunky bang bob so much, when she pulls a bit back from the sides, like she did in these pictures. I thought she looked…I’m going to say exuberant. She always does when William spends time with her in public. He wasn’t stingy with the pda, either, so she was on cloud 9. Plus she really really loves supporting sports, so she attends as many high profile (hard to get a ticket if you’re a pleb) events as she possibly can. In fact, I’ve yet to hear of her turning one down, but I know it’s a cause that’s very close to her heart that she’s keen on making a difference for ;). Oooh Kate, you just make it so easy for us, stop it! Ray, your second paragraph made me laugh. Too funny! Kate is trying really hard to make a difference, so we should mock her efforts ;). I do think it is funny that this side hug has caused the media and Kate fanatics to talk about how in love these two are. This always happens with the slightest touching. It was a side hug. To me that is not really PDA. But it just shows how little PDA these two show and therefore a side hug is a huge deal! It just makes me laugh. It makes me laugh, too. It’s a side hug, not a kissing session. I agree Ray, her bangs look much better when the sides are pulled up. I find it a bit odd that Kate only seems genuinely happy and relaxed when she’s around William. Even in the pap shots taken earlier this year she was never this happy when she was around George and I can’t imagine she’s this happy around Charlotte either. I get the feeling that she is completely in love with and devoted to him and his happiness even more so than her own children. But I’m not so sure William feels the same, though not to say he doesn’t love her but I don’t believe his world revolves around her as her’s does around him. Very interesting perspective. It would explain why she put up with so much during the dating years. I recall reading that when they were dating Will would call Kate when he got off work and she would start his bathwater and dinner. If you look at how everything in her life came second to William and his needs while they were dating and even now she seems to be completely guided by him and what he thinks is best. Lauri I think you are spot on that Kate’s world revolves around him. I am sure Will also expects it. Will’s world revolves around himself so I am sure he expects his wife to revolve around him too. I feel like Kate lost her identity when she became Will’s on-call girlfriend. She rearranged her life for his and I think she practically idolizes him. Kate feeds his ego. I had never heard that she drew his bathwater when he was on his way home. That is a little 1950’s housewife, isn’t it? I kind of feel bad for her, but then I remember she chose this herself. I’ve never heard the bathwater anecdote before, but it sounds plausible. It depends on the situation and their dynamic, but that’s something that his staff would usually do for him. I agree with all the previous commenters that Kate really lost her identity with Will. Forgoing a career, or even an actual job (ie. Jigsaw) so that she could be available whenever Will called. I’ll never forget the story of the boat race that she was supposed to take part in during their break up. As soon as Will came back, she abandoned her team. Whether it was her own decision or pressure from Will, who knows, but again she dropped a hobby of hers so that she could be available to him. What gets me as well is that her family never seemed to discourage it. Whats more, I also blame Will in it. In my opinion, when you love someone, you want them to have hobbies and interests. Oh, no. In this day and age? Drawing his bathwater and having his dinner ready? I think you are definitely onto something, Lauri. Her world does revolve around William. He may love her, but obviously, his world does not revolve around her. Or, not as much. As for the kids, I so hope she does love and enjoy them as much as they need to be loved and enjoyed. I think Kate’s expressions are very exaggerated here. I feel like she is putting on a show to act into it. There are times Will is upset and Kate isn’t which seems like Kate is not really following the game. I have heard that she really doesn’t care for rugby, but that she didn’t want to be a rugby widow during this. Did anyone else hear that? So it would make sense that she is trying to seem really into the sport, especially when she knows photos are being taken and photographers love expressions from her. As for the pants…..to me they are as bad as her skinny jeans. Yes these are pants, but they are just as tight and with the pattern its hard to tell they are pants. I want her to wear pants, just not skin tight ones. She is still really dressed up. It looks like she is wearing heels and a blazer with velvet, both of which really dress up the outfit. She could have dressed down a bit here. I am surprised she didn’t wear her cute red blazer since she was rooting for Wales. This just seems an odd venue to wear this outfit too, especially the pants. I think she is trying to hard now to be on trend. I’m guessing that rugby is a bit hard to follow if you haven’t grown up with the game. It can be confusing if you don’t know the rules and how the scoring works. But if you give it a chance then it’s really exciting to watch, especially if it’s country vs country, you can really get into it. It’s 40 minutes each way, with a 20 minute interval when the teams swap ends so it doesn’t take up a whole day, like cricket. I’ve seen the photos where Kate’s reacting and William is not, makes me wonder if Kate has lost the thread of what’s happening so she’s just throwing a reaction out there. Maybe Kate forgot who she was rooting for. Kate probably only rooted for Wales because William was rooting for Wales. Holly batman thick extensions!!!! !That photo, in which she is swinging her hair really showcases how thickly her mane has been enhanced. The hair flipping is so pretentious, if you look at earlier pics of her as she was dating Willy, she did that less it seems. She flaunted herself less at the beginning and more as she got more “popular”… Or more medicated. She looks medicated, and the hair does look like extensions and she makes a big deal now with her hair flipping and twirling. Either it’s a huge sign of insecurity or a pretentious thing like oh look at how rich and pretty I am. It’s not flattering for a royal who’s rich off of the backs of taxpayers. KMR – the quarterly totals are coming up…. where are you putting this appearance? There was no interaction with the people and no official ceremony. Do we stick this with the Prison and Anna Freud appearance, does it go with Royal Family appearances (since she was with William and Harry – like Christmas) or do you think it goes in “Out and About” – like when she went to Goring Hotel for the party or Wimbledon? I heard that this wasn’t counted as an official work appearance on the court circular. I don’t know if that is true or if they ended updating it. I usually reserve Royal Family Appearances for ones that involve the Queen. So I wouldn’t count this as a RFA. I don’t know where I would put this one. I’ll have to think about it. BTW, I’m doing the quarterly review on Sunday. I have a Harry post today, and a Leti post lined up for Friday. G&C are cute kids. I’m all about baby cheeks and chubby hands and arms. It’s nice that Maria is physically engaging with George while holding Char. People are begging for these pictures. They need to beessential stingy. At some point, there will be no more demand and people will lose interest. I never like to make an assumption about a person’s mental health but Kate has dead eyes. Her expressions are too exaggerated. It’s like she practicesuffers it. It made me sad when I saw the pda pic. She lights up when Will touches her. And that doesn’t happen often. Those pants are horrific. And they are too tight. Harry. I just can’t. The side eye pictures are proof that we are meant to be. I have perfected the side eye. And so has he. We will side eye together when we marry. KMR, you need to put a comment to prepare me for the hotness that is Harry. I read the post 10x. “We will side eye together when we marry.” Too funny! And that hair flip. You can’t tell me that’s not a weave. And that is a hair flip of a woman who wants you to take a picture of her doing just that. Kates poka dots are not nice on her, but it does look good in the other pictures with the model modeling it. some clothes don’t do it for others. I believe the pictures of charlotte and George were staged bc you know that people say princess Anne don’t like them and Kate don’t like them and Kate not accepted. It just proves it was a lie lol trying to depict a family. Lol the kids are cute. Yes Charlotte looks almost like George. They are beautiful!! I don’t think Anne interacted with George or Charlotte. It wasn’t about her, it was about watching the helicopter. I think George just likes watching the helicopters. I’m glad others are realizing the teeth. I’ve noticed it for several years, but even more lately. If you compare pictures of her while dating Bill, you will notice they aren’t as long. I know there were reports she had braces put on the back of her teeth, but they won’t make them literally grow this much. I had braces as a teen and then again in my 30’s as my teeth shifted. I recently got the braces off and was unsatisfied with a few teeth, so my dentist added something to the side of the teeth to make them more uniform. It’s not veneers. So I’m wondering if she is building on her original teeth? It’s starting to look unnatural. I’m wondering if she wants bigger teeth to make up for her thin top lip. George is adorable and looks exactly like a little Michael Middleton. He’s my only favorite one from the bunch. Charlotte is cute and resembles some of Kate’s baby pics. I was a big Diana fan when I was a kid. What I liked about Kate when she first came onto the scene back at university was that she seemed relaxed, sporty, and even slightly bohemian. Her silver jewelry and relaxed style seemed refreshing. Now it seems hard to believe she was ever that university student. The extensions are too much. Kate, we have Google image. We know what your hair used to look like. I think the new bangs/fringe are to disguise forehead wrinkles since she’s probably giving botox a rest for a bit. And I wouldn’t go as far to say she copies Diana, but she does a great job of mimicking. She plays up a mole/beauty mark above her lip from time to time just like Diana. Never did before marriage. And the heavy eyeliner, don’t even get me started. At least the pants at the match weren’t the awful tight jeggings. Billy Boy seems like he’d be a moody handful. I’m finding other Royal houses much more interesting and refreshing. I adore Crown Princess Victoria of Sweden and Prince Daniel. She would never have worn such a flashy tight dress when visiting a prison. LOVE how you all call Carole- Scrarole. So appropriate! She’s always had big teeth. The only procedure I think she’s had while under general is a nose job. The tip used to be more bulbous. It looks like she had some cartilage removed for a smaller and more shapely tip. Other than that I think she does a lot of skin treatments and gets injections when she feels like it. I don’t think she’s done much in the way of PS. The pony tail hair clip-ins or extensions she gets look a bit Barbieish sometimes but I love them all the same lol. She’s had big teeth, but not the exact same ones as now. IMHO 🙂 She’s definitely added something to them to make them more uniform. And not simply whitening. I’d wondered if she’d had a nose job, too. Sometimes the extensions look more natural than other times. Her uppers are all a uniform length now. In pre-engagement photos, her two front teeth are slightly longer than the rest of the uppers. I know I seem to have an obsession with her teeth, but my bestie is a dentist so she’s turned me into a tooth watcher! Yes! They are all uniform up top now! They seem even a bit larger now, but could be because of weight fluctuation. She’s definitely done veneers or added to them in recent years. I’m a tooth watcher too lol. Probably because I had to have braces twice in my life. Kate definitely got veneers after the engagement. I wish Kate would return those hair clips to the 90’s. Along with her scrunchies. For supposedly being such a stylish woman, her hair accessories are very dated. I never see anyone anymore wearing those claw clips that she is here. And I have seen other photos of her wearing them when out and about. Maybe it is a cultural thing. Do women in the UK still wear these? Claw clips? I missed those in the pictures and I went back and looked. Do you have a link to other times and I agree with you. Claw clips are for younger people I think and her hair is too thick anyway. Willy doesn’t look like such a grouch here. He’s quite loved up to Kate as well, which isn’t surprising being that she looks great here. Her hair color is quite dark right now. In my opinion this is when she looks best. Summer sun kissed, dark glossy hair with her pony horse hair clip-ins, and while at her happy weight. Hair half-up or bangs are the thing to do when you’re going for youthful, and that’s what she’s rocking right now. She looks younger. Harry’s expressions are hilarious. But look at how closely he watches his brother. Ever since he was little, he’s always been keeping a close eye on what Willy is doing. So cute. Oh goodness, a really horrible thought just crossed my mind. That “OMG he’s touching me” dazzling smile Kate threw out there could have her thinking she can capitalize on his good mood and get to work on 3.0 that night. I need to go scrub my brain. If we get an “HG” announcement in about 4 months we’ll know when 3.0 was conceived. EWWWWW I don’t want to think about that. BLECH!!! I don’t even want to go there, but if that happens I hope they at least buy a new turkey baster. I am not so sure that even Kate would be stupid enough to pull another ‘ooops’ and that’s pretty much what I think Charlotte was since William made it clear that one was enough for now. No, I don’t think that’s on the radar. People can only be pushed and fairy dust only goes so far. I find George such a lonely and sad kid, no friends, hidden away, since maria does the dirty work, why dont we often see kate with her kids out and about??? what does she do all day, kate face is a mess, no amount of hair bangs/extensions will cover her aging,she looks 45 yrs and that make up is not helping, polka dots please!! what happened to wearing a normal pair of jeans and sneakers and a Tshirt all the royal women are doing it!!! I think Kate is suffering from depression and is on meds. I don’t think she is quite up to being out and about with the kids in public more. William was obviously blinded by her adoring manner when they were dating and had not a clue as to what he was getting himself into when he wed her. She seems so very frail emotionally and I blame Carole for not letting her become an independent woman and for pushing Kate off on a future King. Really, you don’t see that much happiness on W&K’s faces. The occasional smile and laugh, but Harry seems far happier an individual. I hope the kids don’t suffer from living in a sad household. And, sorry, I do believe it is that. Hi Jenny, I agree with you. I think Kate is emotionally fragile and I, too, blame Carole for pushing Kate into a relationship and then marriage to William. Apparently it was Carole who kept things going when times got tough pre marriage and post marriage too. I’m not impressed with a woman who would push her daughter into something that the daughter just may not be tough enough to handle. Kate is not getting a pass from me anymore, there are many people out there with very tough issues but that does not stop them keeping their head up and continue with work and looking after their families, whether carole damaged her is questionable, kate is just used to being taken care of, smooching her way without responsibility and know she cant do that anymore, why marry into the RF if you know you cant do your job and yet you want the title and perks thats ridiculous shes a selfish human being and only thinks about herself!! Agree 100%, Overit. There is no way these days that anyone could be unaware of the ongoing high visibility and constant scrutiny that comes with being ‘royal’. Kate had the best part of ten years to consider what she wanted, and bow out – as did other women William courted – if this kind of life was disagreeable. Both Kate and William do not display much ability or empathy. Just the products of a sense of entitlement. The photos have disappeared from the Womans Day site. That stinks. I saw them yesterday. Hey My2Pence….I see you posting on Royal Gossip and I’ve tried very hard to sign up. There appears to be no way to check and contact the admins…I know this isn’t the exact right place to ask but any ideas? Every time I try I get needs admin approval and that I will get an email….hasn’t happened that second email. Sorry KMR if I am out of line asking here and feel free to delete this post if it’s not ok.
Now as far as Kate goes and her appearances. A depressed sad person wouldn’t come out of hiding to attend glam events or anything. I know this. I have suffered from depression for years and it doesn’t come and go depending on what I want. At it’s worst, I’m in bed. Kate gets no pity from me and yes of course Carole is horrid for using her daughter (which backfired big time on the Midds) but Kate was hardly a victim and if she tries to play that card she and her ghastly family will be (I think) slaughtered in the press for even trying. No way is Kate the innocent virginal lamb led to the slaughter or a wide eyed enchanted woman who truly believed that William loved her. His I’m free dance anyone?? Nope, she sold out, degraded herself, threw her self respect and life away for a used ring and a title. Diana’s ring will always be just that. Diana’s ring. So much for a new start to a life together, that ring could have been in William’s pocket and I think it was Harry’s anyway. Kate is a default wife and now that she has two children she is of no use to the ‘firm’ and I wonder if her outrageous behavior is a form of rebellion. Just a thought. Most of RG is too harsh for me, but sometimes I feel the need to get on there and counter one of the firm sugars that keeps posting inaccurate info! I’ve sent a message to one of the moderators of RG to see if she’s seen your registration request. If I get a response, I’ll post it on this thread for you. I tried to register there too and just gave up. Especially after reading posts as a guest. Sometimes feels like being thrown between two fighting cats. And I’ve actually crossed the street when I’ve seen cats circling each other as they prepare to fight. No need to try to stop it and come out with a million cuts. Awesome. And very much appreciated! OT: Princess Anne is currently doing a tour of the Caribbean. So why the hell do W&K need to do one too? These tours represent HM the Queen, so it’s equivalent to HM visiting twice in such a short space of time. She would never do that. The upcoming Caribbean tour is definitely just a vacation for the Cambridge’s. They are rubbing it in and don’t even care! W&K did a tour of NZ in April 2014, and Harry did one a year later in May 2015. And Charles went to the Middle East at some point recently after Harry had been there not even a year earlier if I recall. These things happen. I thought Harry’s visits were personal i.e. part of his military career? The NZ tour was an official royal tour. Harry saw more and met more people than W&K did when he was here. It was a very good move for Harry to visit as I think he captured a lot of attention and a large number of fans from the younger generations too. RT, for me some visits make more sense than others and not everything is a “royal tour”. For most royals, the visits are for business not for visiting wineries. Other things are scheduled around business, but often it starts with the royal having a business reason to go to that place. The Duchess of Gloucester is headed to the Bahamas soon, because she’s the patron of a military group that is stationed there. Anne is there on business and meetings for the Duke of Edinburgh Commonwealth Study groups. She went to Canada for the meetings last year I think. W&K wanted to visit NZ and Australia, so the tour was set up. A royal aide admitted it, saying the tour was “all their own idea”. Their California and NYC visits were similar. They are going where they want to go, not always to places that want them to visit or to do things that are logical. My guess would be, they decided they wanted to go to the Caribbean so the staff have to set up a tour. I don’t really care to even see George and Charlotte, to me, they are just babies. They don’t do anything. I would rather see adult royals. I find it interesting that some Kate blogs have decided to post the pictures. And when challenged, one blog actually said she was reviewing all pap pics on a case by case basis and she decided these were harmless. Oh. Is that was WK letter said? That fans with blogs can make the decision for them? I don’t know what all the hoohah is about the kids either. uh huh …baby is cute and it stops there for me. Can’t believe why people would want to see their pictures leading to paps hiding in a van to get pictures of them. Well, Beatrice, I don’t get all the fuss about the kids either. I remember when George was born a newspaper had headlines which I found to be very astute and succinct, but this was after all the blaring glaring fanfare. It read simply. Woman has baby. My take on the *side hug* is that yes, he touched her but in general it looks like she is staring straight into the camera with a ‘see, he does too love me look’ and I’m with the others who say that she doesn’t seem quite ‘with it’ in the solo picture. I’m not surprised at the choice of wear, it certainly brought attention to her. I doubt that William will dare say a word about the picture of Nanny Maria and the children. It would be some interesting headlines “William in a rage over pictures of children with Nanny” and simply highlight their comfort with Nanny Maria. They really do seem very content and just fine being with her. Nanny Maria is a Godsend. With all the crap I’m reasonably sure she has to put up with she has stayed. And, gee, she wasn’t even looking at/for the camera. Guess she’s a pretty secure woman:) As far as the children’s looks go, I won’t even comment because to me they are just children with no choices about their looks or even clothing yet. I don’t know if Kate loves William but for sure she absolutely **needs** him. He has been and still is her entire identity. For her to cater to his every whim and basically be his little robot and servant doesn’t say love to me. It says fear and desperation. I am not even sure that he’s a person to her, he may be just a title. I definitely don’t see a happily married young couple in these pictures even with the hug, but then again I tend to see what I expect to see. William might have hugged a passerby in his ecstasy over his team beating Harry’s. OK, ott, but still ‘I’d be so happy I’d kiss my mil’ are lyrics to some song.